Beef Stroganoff is one of those recipes my whole family loves, but I don’t make that often. It’s a great one pot meal that can be made quickly on the stovepot, or in the slow cooker like I have done here. This slow cooker stroganoff, made with stew meat, is the most wonderful, flavorful stroganoff I’ve ever made. I don’t think I’ll ever make my stroganoff any other way now, except the slow cooker. To make this stroganoff really easy , I used Progresso’s new Recipe Starters in Creamy Portabella Mushroom. It adds a rich creaminess that’s super easy. To serve this, I simple made some egg noodles in a separate pot right before I was ready to serve, and then stirred in some frozen and defrosted peas, as well as some sour cream to my stroganoff. There’s 5 new Progresso Recipe Starters Cooking Sauce in total. Check out the last recipe I did with this Progresso’s Recipe Starters Creamy Portabella Mushroom, Slow Cooker Chicken Marsala and Rice. Click here for a to save 50¢ on Progresso recipe starters Cooking Sauce. Add stew meat, onion, garlic, Progresso sauce, Worcestershire sauce, dried rosemary, beef stock and balsamic vinegar to slow cooker. Cook on low for 6 – 8 hours. After beef has cooked, add peas and stir well. Add sour cream and stir. Serve beef stroganoff over cooked noodles. This recipe sponsored by Progresso. All opinions 100% mine. I love making stroganoff with stew meat and it’s so smart to do it in the slow cooker! As soon as the weather cools, the slow cooker starts making its appearance more often. 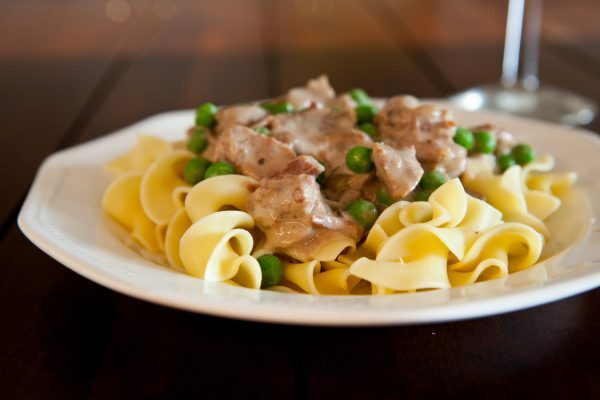 Stroganoff is one of our favorite cold weather meals! Keep these slow cooker recipes coming! I *heart* my slow cooker — excited to try this recipe in it!